Five goals from Hibs gave manager John Collins an early Christmas present as the Buddies suffered a rout in the Capital. Guillaume Beuzelin and Chris Killen shot Hibs into an early lead only for John Sutton to claw a goal back for the visitors before the half-time interval. The impressive Dean Shiels blazed in a strike from 20 yards to increase the home side’s advantage. And Moroccan duo Merouane Zemmama and Abdessalam Benjelloun added neat finishes to complete the scoring. Scott Brown was missing from the Hibs squad after a joint bid for him and Kevin Thomson was rejected this week. Captain Thomson was suspended, while Brown’s absence was down to a training ground injury. “It was everything you ask for, creating chances and putting the ball in the back of the net,” Collins said. Collins said John Sutton’s counter in the 5-1 win was “the only disappointing aspect of this afternoon”. Reports that midfield duo Scott Brown and Kevin Thomson had been dropped for the forthcoming Boxing Day Edinburgh derby were “a complete lie,” Collins added. With only two minutes on the clock, Hibs set out their stall when Shiels sent in a left-footed shot from the edge of the penalty area, but watched as his effort flew over the bar. Moments later, David Murphy followed up another effort from long range, but could only send the ball wide of Tony Bullock’s goal. With just 11 minutes played, St Mirren were forced into making a substitution when Billy Mehmet suffered an injury and limped off, to be replaced by Scott Gemmill. John Collins’ men continued to look the stronger side with further efforts from Steven Fletcher and Michael Stewart, and eventually broke the deadlock after 21 minutes when Beuzelin easily netted from just six yards out. The French midfielder picked up a Fletcher cutback and aimed for the bottom-right of Bullock’s goal, to watch his side-footed effort hit the back of the net off the post. Fletcher’s celebrations were short-lived when his involvement in the game came to an end through injury and he was replaced by Stephen Glass. Just two minutes later, Hibs increased their lead through Killen when the former Oldham player benefited from some clever play from Shiels, poking a low shot under Bullock from 12 yards. St Mirren managed to pick up some pace as half-time approached, but rarely threatened at the other end until Sutton handed his side a lifeline on 41 minutes with a neat clipped finish. The Hibernian defence had failed to take care of a long kick-out from Bullock, allowing Gemmill to set up Sutton from the right with a headed flick. 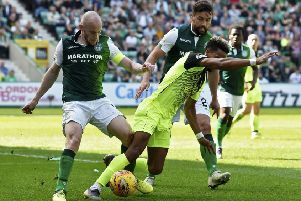 Hibs kept up the pressure after the restart with a shot from Steven Whittaker flying in from the right-hand side of the penalty area, but Bullock held well to frustrate the home fans. The home side then set up a fast-paced counter-attack and Beuzelin set up Sheils who beat Bullock with a superb strike from 20 yards to make it three. Zemmama added a fourth goal soon after when Benjelloun set him up from the right-hand side and with Bullock’s goal in sight, the Morrocan made no mistake. Shiels was replaced by Jamie McCluskey on 66 minutes and received a standing ovation from the home fans, following an impressive performance in the role normally filled by Brown. Zemmama’s favour was returned moments later when Benjelloun piled on the misery for the Buddies after his fellow-countryman set him up to take the home tally to five. Benjelloun curled in a cute right-footed shot past Bullock from left side of the penalty area and the visiting fans were soon heading for the exits. As time played out, Hibernian continued to effortlessly control the match and could have easily added more to their impressive tally, but settled for a five-star performance in the capital. Hibernian: Malkowski, Whittaker, Martis, Jones, Murphy, Shiels, Stewart, Beuzelin, Zemmama, Killen, Fletcher. Subs not used: McNeil, Glass, Hogg, McCluskey, McCann, Stevenson. St Mirren: Bullock, Potter, McGowne, Broadfoot, van Zanten, Murray, Lappin, Reid, Brittain, Sutton, Mehmet. Subs not used: Smith, Millen, Brady, Maxwell, McCay, McKenna, Gemmill.